At the moment, Somalia intends to move forward and give hope to its citizens. In order to do that, it must earn revenue to provide the basics: build sustainable peace, improve security for everyone in Somalia and provide public services: education, health, sanitation, access to clean water and build infrastructure. Resources that can generate revenue include the development of livestock, fishery, agricultural products, minerals, oil and gas in addition to collecting taxes from property, income, payroll or workforce, corporate, capital gains, wealth, goods and services (value added tax [VAT]) and many other types of taxes. Somalia has high hopes in gaining revenue from oil and gas, currently hidden in the underground of Somalia (onshore) and below the Indian Ocean-floor (the offshore). More than two decades ago (in the eighties), there was an “oil and gas exploration rush” to Somalia, driven by the country’s huge oil and gas potential. The rush was led by Conoco-Phillips, Shell (Pectin), Amoco, Eni, Total and Texaco, who left the country in “force majeure” waiting to come back at the right time, security wise. In a recent meeting, the Minister of Resources said, “Given that the security condition of the country is improving at a rapid speed and the presence of legitimate transparent government, companies of the past and the new ones are all welcome. Somalia will be open for business sometime in 2013 and we honour the agreements of the companies who filed “force majeure” and left the country due to the civil war. We are now working to review the Petroleum Law and make it more competitive and attractive to oil companies and investors”. Somalia is aware of the recent discoveries in Kenya, Uganda, Tanzania and Mozambique and it is determined to join the race for oil and gas production. In addition to the “giant” oil companies, currently there are small companies who are aggressive risk-takers who want to start and get hold of their share before the giants come to play. The “giant oil companies” seem to be reluctant and shuffling their feet at the moment. In getting ready for business, Somalia needs to carry out institution building: establish the Somali Petroleum Authority (SPA) in accordance to Article 8 of the Petroleum Law of Somalia. SPA is the competent authority that regulates petroleum operations in Somalia by ensuring that all activities from exploration, production and marketing adhere to the requirements of the Petroleum Law. Somali Petroleum Corporation (SPC) exists already but it may need re-structuring so that it meets the high expectations of the current government. In the surrounding countries of Kenya, and Uganda petroleum was discovered by small and medium companies. An example is the recent discoveries of Tullow Oil Plc. in Uganda and Kenya. Recently, Kenya has awarded licences to companies capable of working in deep-sea offshore blocks though that had triggered anger from the Somali side. Shell, Anadarko and Eni are not only the major Western oil and gas companies operating in East Africa offshore. For example, UK gas major BG Group is active in Kenya and Tanzania. BG Group entered Kenya in 2011, acquiring an interest in two offshore exploration blocks: L10A and L10B in the south of the Lamu Embayment. In Ethiopia, Africa Oil Corp has completed farm-out agreement with New Age (African Global Energy Ltd) whereby New Age acquired an additional 25% interest in Africa’s Oil Blocks 7 and 8 in the Somali State of Ethiopia. Africa Oil Corp and Tullow Oil Plc. work together in South Omo concession. Elsewhere in offshore Indian Ocean margin, in Mozambique US-based Anadarko Petroleum and the Italian oil and gas-company, Eni have both recently announced significant gas discoveries (giant gas fields) in their respective blocks in the Rovuma Delta. In Rovuma, Tanzania another gas discovery was announced by Tanzania’s Petroleum Development Corporation. The recent natural gas discoveries off the coast of Mozambique in the Indian Ocean are important because of the size of the reserves as well as the country’s relative proximity to markets in Asia. During the writing of this article, Statoil announced its third gas discovery in offshore Tanzania. The bulk of the Indian Ocean margin lies within Somalia and whatever discovery happens there in the Indian Ocean alerts the ears of the Somalia’s Ministry of Resources. That is why Somalia aggressively wants to join the race for oil and gas discoveries of East and Horn of Africa. Now the name of the game in East Africa offshore is gas. Due to its geographic location, Somalia should look for markets and investors from the East. Countries such as Japan, India and China will be eager to consume Somalia’s oil and gas. From 1960 to 1969 oil companies were slowly coming in to explore for oil and gas. However, on the 21st October 1969 a military regime came to power and announced Scientific Socialism as its ideology, joining Somalia to the Soviet Block during the Cold War. Thus Somalia became un-accessible until 1977 when Somalia invaded Ethiopia to reclaim “ Western Somalia”. Somalia was defeated and it turned to the West for friendship. In the eighties companies aggressively came back to carry out exploration. But in the eighties , political stability was slowly eroding away and security was gradually breaking down as the military regime grew more authoritarian using a single party system, incompetent, infected with clanism, nepotism and corruption. Most of the major clans were not satisfied and consequently established political movements to up-root the regime and ultimately on 26th January 1991 it was overthrown. Later, the President of Somalia, Comrade Siyad Barre died in exile. Unfortunately Somalia entered the darkest ages of its life: lawlessness, anarchy and the absence of a central authority. Wasn’t Somalia Drilled For Oil And Not Found?! N.B The last two wells drilled in the Dharoor Valley of Puntland are included. Wasn’t Somalia drilled for oil and gas and why new ventures now? 1. Has oil been generated in the area? Yes. There are some large oil seeps in North Somalia (Somaliland) and in the Southwest where Ethiopia, Kenya and Somalia meet. In Sagaleh-1 of Agip (Puntland), oil staining was found in a porous limestone-dolomitic series of the Jurassic. In Cotton-1 of Agip, a good gas show was found at 91m of Cretaceous limestone. Auradu Paleocene limestones showed oil stains in the Sagaleh, Cotton and Gira wells. Afgoye-1 of Sinclair, north of Merca also had a good gas show. In Calub and Halala (Wardheer, Ethiopia), Tenneco Oil Corp discovered gas and these fields are not far from Galinsoor in Galmudug. Again Tenneco discovered a non-commercial oil in El Kuran near the Bakool border with Ethiopia. 2. Are there suitable reservoir rocks? Yes. – A reservoir rock has porosity and permeability. Porous sandstone and fractured limestone are good reservoir rocks. Porous dolomitic- limestone are plenty in the sedimentary sequence of Somalia. There also basal clastics that terminated in early Jurassic. 3. Are there seals or cap rocks? Yes. – Oil and gas accumulate only where seals occur above and around reservoir rocks so as to stop the upward migration of oil and gas and form traps. The Reasons why previous exploration did not reach a commercial discovery? 1. Early geologic models were incorrect – bad well location occurred in many wells. 2. Early data were of insufficient resolution – bad well location was a major problem. Many of the previous tests were drilled on old or inadequate seismic data. Better geophysical techniques and modern explorations concepts will provide improved opportunities for any exploration undertaken in the future. 3. Technological development in seismic surveying and in other areas of exploration has occurred and now exploration is more promising. 4. Favourable terms and a new petroleum law with a production sharing agreement, were passed by the parliament in 2006 and Somalia is ready for exploration, development, production and exporting. 5. Stability is slowly coming back and the country is democratically transforming. 6. Location and geographical: Not far away from the emerging markets of China and India and the production is easily exportable. Why is Somalia under-explored and neglected for so long? Somalia has been sparsely explored. The drilling density shows you that wells are spaced far away from each other. However, Somalia contains several exploration plays with world-class potential that remain to be tested. Just prior to the collapse of the “Somali State” in December of 1990, several concessions were held by major international petroleum companies and at least three key wells were scheduled to be drilled. Then the civil war broke out and companies have to flee. 1. Political reason and instability: Petroleum exploration began after the Second World War and the first exploratory well, the Sagaleh-1 was completed in 1956. From the early seventies to mid- eighties Somalia was roughly in the Soviet Block and slight exploration occurred. Things changed after 1985 when giant oil companies rushed to Somalia to take up concessions for exploration. However, in January 1991 the Somali government collapsed and the country went into a civil war. Then the oil companies declared force majeure to return back when the political condition stabilises. Then in 2006, the then President of Somalia, Abdullahi Yussuf, invited the companies with the lease to come back to resume their work. But none came back and the force majeure condition was revoked. 2. The boom elsewhere: There was a boom going in the Middle East and then West Africa and Somalia was considered as a frontier province that requires a lot of resources. Oil companies were very busy in West Africa, the Middle East and South America, mainly Brazil. 3. Low well-density or drilling density: To this day, there are 63 wells drilled in the various basins of Somalia and none of these wells has been commercially successful although some have had shown hydrocarbon shows. One of the reasons is that wells are spaced far from each other at distances of 50 – 100 km apart and in some cases spacing was 250 – 400 km. Most of Somalia has a Jurassic to Miocene sedimentary section that ranges from two to five km thick and is divided into seven unconformity-or transgression-bounded sequences. Thicknesses of these sequences vary significantly within eight depositional basins. 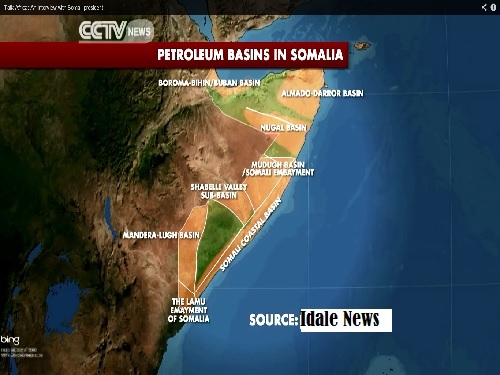 There are at least eight petroleum basins in Somalia that hold potential prospects ready for exploration and development. Some of these sedimentary basins have sediment thicknesses more than five kilometres and contain good source rocks, reservoir rocks, seals and traps necessary for oil and gas to deposit. Inland, the Jurassic to Tertiary section consists primarily of inter-bedded platform limestones and shales, locally with evaporites. This section is transitional eastward to deeper water shelf and basinal deposits along the coastal margin. Mesozoic rifts are present in northern Somalia. The early Cretaceous was a time of widespread emergence. Deltas related to major drainages developed in the Late Cretaceous and Tertiary; subsidence led to accumulation of a thick Tertiary section of deltaic and marginal marine deposits in southeastern Somalia. The main structural elements resulted from rifting of Gondwanaland during Carboniferous to Jurassic, separation of Madagascar-India in early Late Jurassic, and opening of the Gulf of Aden in mid-Tertiary. In central and southern Somalia, warping and down-to-the-coast faulting is Late Cretaceous to mid-Tertiary in age. In the north, most deformation is related to Gulf of Aden rifting in which Africa separated from the Arabian Peninsula. Mature, oil-prone source beds combined with potential reservoir rocks and structures occur in a variety of geological settings. Viable exploration plays include rift basins, regional arches, carbonate platform margins, deltaic complexes, and faulted basin margins. Time has come for investors and international oil companies to aggressively consider exploring for oil and gas in Somalia. The country has a lot to offer: eight sedimentary basins with columns of 5 to 6 km in several areas and a range in age from Jurassic or Triassic to Tertiary. Tectonics for the past 200 my have been extensional, leading to these thick and varied columns. Facies changes, faults, arches, and folds associated with extensional tectonics provide many possible combinations of trap, reservoir, seal and source rock. Many of the previous tests were drilled on old or inadequate seismic data. Better geophysical techniques and modern exploration concepts will provide improved opportunities to present ventures. The country is also located geographically in a strategic place in Africa having a long coastal line and it is easy to export to India, Japan and China and other emerging markets around the world. We remain optimistic about Somalia’s hydrocarbon potential whether it is onshore or offshore. But companies need to be socially responsible: transparent, free of corruption and bribery. We want companies to operate safely without causing environmental degradation like in Niger Delta or in the Gulf of Mexico. Likewise companies should contribute to the communities in which they operate by creating jobs, using local supplies and supporting community development. The aim is to make an ever-lasing difference to the quality of the communities’lives. 1. Barnes, S.U. ; 1976, Geology and oil prospects of Somalia, East Africa; AAPG; Bulletin; v.60; pp. 389 – 413. 2. Brady Michael J and Harms, J.C; Exploration history and hydrocarbon potential of Somalia: A technical talk; Kansas Geological Society – Technical Talk 2002. 3. Bosollini, Alfonso; 1989; The continental margins of Somalia – Their structural evolution and sequence stratigraphy; Memorie Scienze Geologiche; v. 41; pp: 373 – 458. 4. Cella, F.; Dorre, A.S and Rapolla A., 1995; Gravity study of the crustal structures of Somalia along the International Lithosphere Program Geo-transects; Journal of African Earth Sceinces; Vol. 30; pp. 263 – 274. 5. Harms, J.C and Naleye, Ali M; Petroleum exploration in Somalia; Geology and mineral resources of Somalia and the surrounding regions; First Agron; Oltremare, Firenze; Relaz e Monogr. 113, pp. 417 – 428, 1993. 6. SOEC (Somaliland Oil Exploration Company), 1954; A geological reconnaissance of the sedimentary deposits of the Protectorate of the British Somaliland: London, Crown Agents for the Colonies; p.42.